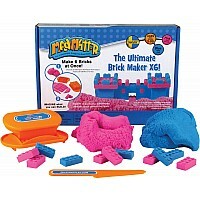 Create your next castle with these fun molds. Build towers, stairs and stone walls around your castle. The set includes 8 plastic molds and tools for use with Mad Mattr® ,Kinetic SandTM, Bubber® or Shape it!TM. Don’t forget to paint your castle with Sand PaintTM!